A warm welcome to the website of The Ivor Gurney Society. Since its inauguration in 1995, the society has initiated the dedication of a memorial window to Ivor Gurney at St Mary de Lode Church in Gloucester, erected a new memorial stone in the churchyard at Twigworth, supported the publication of two volumes of Gurney songs, a volume of piano music and a bibliography, and undertaken extensive work in cataloguing and conserving the Gurney archive. The society produces a substantial annual journal (free to members – see the publications page). We have also organised and facilitated a number of recordings on the Somm and Naxos recording labels. 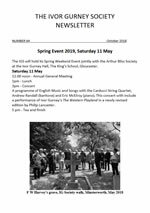 Society events are normally held each spring, where talks and recitals enable members to explore Gurney’s verse and music. A Newsletter is circulated, free to members, at intervals throughout the year. The Ivor Gurney Trust. The Trust’s primary role is to advise and support those involved in research of the life and works of Ivor Gurney. In this regard, the Trust can authorise the use of archival materials held in the Ivor Gurney Collection at the Gloucestershire Archives for the purpose of academic research, publication and performance.